We have all seen the notorious yet ubiquitous “Sent from my iPhone ” signature, and perhaps it is not worth analyzing something so trivial. But we love analyzing everything, and therefore we’re going to analyze the meaning, usage and existence of the “Sent from my iPhone” signature. Android  and BlackBerry users (if there are any still out there), worry not. You guys are included in this discussion as well. -Legitimately writing differently on our smartphones than our computers. For example, our smartphone emails are much shorter, and perhaps filled with words that for some reason only seem correct to the beast known as autocorrect. Unfortunately, none of these “excuses” apply to us. We do know how to remove the default, don’t let autocorrect butcher our writing, don’t let our email length vary with device (some of us even have written 400-500 word blog posts, essays and letters on our smartphones – to the profound dismay of our thumbs), and clearly it means something to us because we’re clogging about it. Before we knew it though, the age of default smartphone signatures then came to be replaced by the age of everyone having multiple mobile devices each with their own default signatures. We quickly came to know that (almost) everyone had an iPhone and an iPad and insisted on switching devices for each email. Around that time, when we bought more mobile devices, we realized that computers were no longer the norm for sending emails, and now almost all of our emails recorded their point of origin. 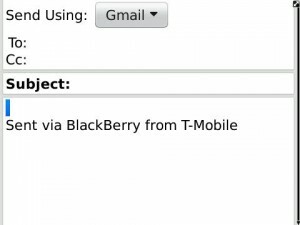 It was then that the sight of reading “Sent from my [insert device name here]” became unbearable. We began to lose sleep over it. We agonized for hours over how to resolve this situation. Then, like a sudden burst of genius, it dawned upon us to remove the signatures. Now recipients of our emails can only guess as to whether these emails were typed with all 10 fingers, or just two.